Balanced Rock, landmark in Texas Hill Country. Balanced Rock was something to see - a 50 ton red granite boulder 10 feet high and 12 feet in diameter resting precariously on three points. Two of the points were pinnacles only a few inches high and no bigger around than a man's wrist. This geological oddity sat on top of Bear Mountain, 4 miles north of Fredericksburg on Ranch Road 965. Although not as famous as its cousin, Enchanted Rock, Balanced Rock was quite an attraction. Tourists from around the world came to see it. No records exist of the number of annual visitors, but that number was probably in the thousands. No one knows how a boulder the size of a Hummer came to rest in such a perilous position. That story was lost in the steady passage of the centuries. One scientist called Balanced Rock "an excellent example of differential erosion or Mother Nature at work in a playful mood." To me Balanced Rock looked like an accident waiting to happen - as if a stiff breeze or a good shove by a 5th grader would send it tumbling down hill. Every high school kid who went up there tried to push it over, but Balanced Rock never budged. It sat there, unflinching, just as it had since before recorded history. Not only was Balanced Rock an unusual sight, the conditions of its existence as a tourist attraction were unique by today's standards. Balanced Rock sat on private property, near an active granite quarry, but the public had unrestricted access to it. Visitors didn't have to sign a waiver. There was no gatekeeper and no admission charge. No one made money from it directly, although the entire area benefitted from the tourists who came to see it. No one worried too much about liability in those days. People came from all over to take a picture of Balanced Rock and to stumble among the boulders on top of Bear Mountain. In today's litigious environment, every stubbed a toe and scraped shin would be a potential lawsuit for medical costs and mental anguish. Did I mention the rattlesnakes? For years there was a roadside park on Ranch Road 965 at Bear Mountain From that park visitors could follow a trail up Bear Mountain to Balanced Rock. Boy Scouts built and maintained the trail. There was no formal system for advertising Balanced Rock, but word got out. It was the worst kept secret in the Hill Country. 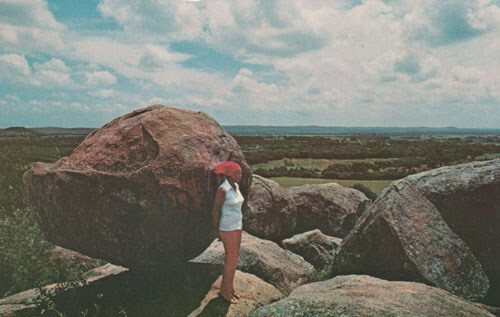 Stores in Fredericksburg sold post cards with pictures of Balanced Rock. ABC News came down from New York and did a story on Balanced Rock. The newspaper series "Ripley's Believe It or Not" devoted a segment to Balanced Rock. In 1971 The San Antonio Express carried a full feature article including a picture of Balanced Rock although some people in Fredericksburg were horrified because a hippie painted a peace sign on it. Balanced Rock was a Hill Country landmark. People assumed it would be there forever. Then on April 19, 1986, the Fredericksburg Chamber of Commerce directed a group of tourists to Balanced Rock. The group returned about an hour later and said the rock was gone. Gillespie County deputies dispatched to the scene found that, sure enough, the boulder had tumbled from its perch. It rolled down a15 foot slope and came to rest against another large rock. Rumors were rampant. Everyone had a theory as to who unbalanced Balanced Rock. A crowd of people came out to stare at the empty place where Balanced Rock once sat. "We don't believe it was an accident," a Gillespie County deputy told reporters shortly after arriving at the scene. "From the looks of it, it was the works of vandals. Whoever did it knew what they were doing." "People are pretty mad about it," the deputy added. Law enforcement officials launched an investigation. Evidence showed that a stick of dynamite toppled Balanced Rock. Citizens of Fredericksburg offered a reward, but the crime was never solved. People once traveled great distances to see Balanced Rock. Now it's just another rolling stone. "Balanced Rock Topples," New Braunfels Herald-Zeitung, April 24, 1986. "New Roadside Park Built at Foot of Bear Mountain," Fredericksburg Standard, November 6, 1963. "Editorials," Fredericksburg Standard, June 26, 1971. "C of C Points to Possibilities for New Industries but Leaders Needed," Fredericksburg Standard, September 7, 1949.